The SMA Plenary Council is an annual meeting to evaluate the ongoing mission of the Society and plan for the future. It gathers together the Superiors of different SMA units in Africa, North America, Europe, India and Philippines. This year, for the second time, the Council is meeting at our SMA House of Studies in Nairobi, Kenya. 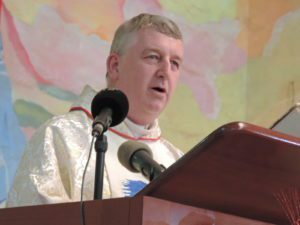 The following is an edited version of the Opening Address of the SMA Superior General, Fr Fachtna O’Driscoll. It is my pleasure to welcome all of you to the fourth and most likely the last Plenary Council of this mandate. I welcome those who may be attending a Plenary Council for the first time. In a particular way, I welcome our two laity representatives: Dympna Mallon from Ireland and Mara le Mahieu from Netherlands and missioning in Tanzania. For the three days immediately prior to my flying out to Nairobi, I attended the meeting in Rome of the Union of Superiors General. Such meetings hold twice per year. The theme of the gathering was Vocational Discernment in an Intercultural World. The theme was prepared in light of next year’s Synod of Bishops on the theme of youth. The opening talk was given by Fr Arturo Sosa, Superior General of the Society of Jesus (Jesuits). The title of his presentation was Interculturality, Catholicity and Consecrated Life. Many of the points raised in his presentation and further discussion are pertinent to our own discussions here at Plenary Council 2017. Later today, Fr Rozario, General Councillor, will bring us through a presentation and small workshop on Intercultural living. Fr Sosa clarified that a charism is a gift of the Holy Spirit to the Church, given to an individual at a particular time and in a particular cultural context. But this charism is not something static. When people from a different culture to the original and from a different historical period ‘receive’ this charism, they bring to it something new from their own cultural background and experience. Thus, the charism is always developing or evolving. I quote one section of Fr Sosa’s talk which, I think, is particularly relevant to us, as we continue to seek clarity around the charism of the SMA today. “The “cultures” of religious congregations are [also] dynamic and evolve according to history. We cannot fall prey to the temptation of considering the charism to be intangible and unchangeable, as something external to and different from the cultures of the persons that live it and their cultures. The call of Vatican II to go back to our sources is not an attempt to freeze the charism as an intangible “culture” that is passed on unchanged from generation to generation. On the contrary, it is a call to creative fidelity to the dynamics of incarnation shown by Jesus and to openness to the present-day challenges to the mission of Consecrated Life as part of the Church, whose raison d’etre lies in evangelizing history”. A quotation from a second paper delivered at the meeting is also relevant. Of course, the charism has to be first of all rooted in the new culture before it can evolve. One must also be careful to note and challenge whenever cultural background is used as an excuse for a refusal to conversion to the common charism. Indeed, one may also note that the charism of a contemplative, mendicant or teaching order is significantly different to that of a missionary Society; one might expect more variation of cultural expression of the charism in the former than in the latter. Nevertheless, I believe this understanding of evolution of charism can help us in our own reflection and practice. We will have discussion during this Plenary Council on Event 2017. This Event, conceived at PC15 at Chaponost and developed since then, is an initiative to help the whole membership of our Society to reflect together on how our charism is being lived today. It looks to the past with gratitude; it looks to the present with passion; and it looks to the future in a spirit of hope. The idea is not to get stuck in the past but rather to learn from the past to see how and where we were at our best and to take from this ‘best’ for our future witness. Since the 2016 Plenary Council the General Council has paid many visits to Units and Regions. I made a canonical visit to the following areas: Benin/Niger, Poland, Cote d’Ivoire, Morocco, Lyon and Strasbourg, and Nigeria. In each of these places, I was inspired by the dedication of many of our members, both young and old, at the coalface of mission or in the retirement house. This is not to suggest that there are no challenges. Reports to this Plenary Council outline many such challenges. It is noticeable that in all these areas, members live the present time with passion and prepare for the future with a great deal of hope. As we will see when we look at the agenda, there is no shortage of topics for discussion. I hope and pray that our discussions will be carried out in the fraternal atmosphere that has always characterised such gatherings. I have every confidence that this will be so. I believe our discussions will be fruitful and the decisions we take will impel us to greater fidelity to our missionary vocation. May our discussions be blessed by the Holy Spirit who has gifted the charism of SMA to each and every one of us. May Mary Mother of God intercede with the Father on our behalf. And may the Servant of God, Melchior de Marion Brésillac look down on us with paternal care. With these opening remarks I declare Plenary Council 2017 open. Fr Michael McCabe, SMA Provincial Superior for Ireland, is attending this Plenary Council as is our Laity Coordinator, Mrs Dympna Mallon. The SMA Secretary General, Fr Sylvère Atta [from Ivory Coast], assisted by the Assistant Secretary, Steve Phillips [USA] are responsible for the day-to-day work of the Plenary Council. Next articleWhat does the US withdrawal from the Paris Agreement mean?